The Manga Cookbook has been out for a while, but I have a copy to give away courtesy of the publisher, so here’s a short review. 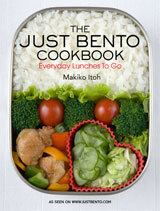 While this is not a bento cookbook, it has a few bento-friendly recipes in it. Besides, the cute manga format will probably appeal to many Just Bento readers (which is why this review is here on Just Bento rather than on Just Hungry). This is a little paperback, with several easy Japanese recipes in manga format. (Just in case you don’t know, manga are Japanese comics. Wait a second…if you’re reading this site, how could you not know manga!?! ^_^) Instructional mangas are quite common in Japan, but I don’t know of any in English besides this one (though I bet someone will tell me there are many more). 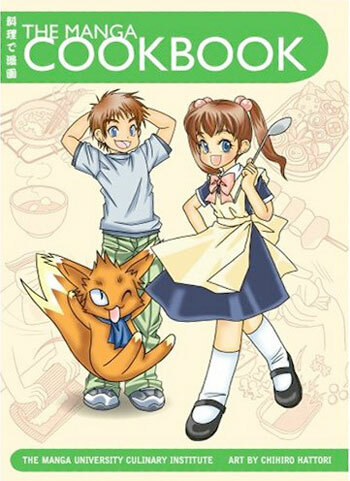 The recipes are introduced by a cute manga girl and a rather hyper animal character that is supposed to be a fox, which looks rather like it belongs in the Pikachu world. The manga, and the recipes, look to be written in English rather than translated from Japanese. If they are translated, they’ve done a really good job of it. In addition, the book reads from left to right rather than the more usual (for Japanese manga) right to left. As for the recipes, provided you can get a hold of the ingredients (and they do not stray too far from the basics like rice, soy sauce, and so on), anyone should be able to make all of them easily, even kids (with adult supervision in some cases). There are color and black and white photographs of the recipes to refer to, besides the manga instruction. Most of the recipes are standard-issue Japanese classics, like onigiri, ebifurai (breaded fried shrimp), kushi dango (sweet rice dumplings on a stick) and so on. A couple are not exactly standard, but that doesn’t mean they don’t belong in the book. All of the recipes are of the type that appeal to kids - or at least, Japanese kids. No strongly flavored or strange ‘adult’ food here. For the charaben enthusiast there are nice manga step-by-steps for making things like usagi ringo (apple bunnies) and boiled eggs with faces on them. The only major quibble I have with this book is that about 24 pages out of the stated 144 total are essentially blank! These have a photocopy-like image of a page ripped out of a notebook that say “Cook’s Notes” on top. I’ve seen this in other cookbooks too, but not for so many pages proportionate to the overall page count. I can’t help but wonder if they somehow ran out of money or something and couldn’t afford to fill up the rest of the book with more recipes and manga. Another, lesser quibble is that the photographs are not of very good quality. But I think that this little book is still a good value though (around $11 from Amazon.com). It would make a great present for a child or teenager who is into manga or anime and is curious about the ‘weird’ Japanese food that he or she sees in them, or an adult who wants a friendly introduction to some Japanese home cooking recipes. All you have to do to enter the giveaway is to leave a comment on this post. As always, to make it more interesting, let us know the one Japanese dish that you haven’t made yet that you are most curious about trying to make. The deadline for leaving your comment/entry is 23:59:59 CET on Sunday, November 22nd. I’ll try to get the book to you before Christmas. I have always been interested with the bento, probably due to the magic of the manga. In watching the shojo heroine eat/make/share onigiri, apple bunny slices, and octopus hot dogs. I would be remiss as a burgeoning cook and a lover of the comic form if I didn't celebrate this text's release. That sounds super neat and perfect for someone like me, haha. If you don't mind, I'll alter your question slightly so I can tell you what I want to try to make WELL: Tamago nigiri. It's some of my favorite sushi, and I can't seem to get the egg part as fluffy as I've had it in restaurants, or as pristine yellow. Not that it's terrible if part of the egg gets browned, but my love of this stuff includes both the flavor and the visual aspect, so I'd love to manage both. So far, I'm 3 for 4 on flavor, 0 for 4 on appearance. I am dying to try (and potentially try to make) Natto! Haha you were right, someone would tell you about more! Tue, 2009-11-17 20:27 by Julie H.
Okonomiyaki! Yup, that is the one thing I've been planning on trying but just have not done it yet. While I've cooked it up on a grill at a restaurant, it's not the same as having to pick out your own ingredients, chop them up, measure out the mix ingredients and hope it all comes out right. Although if it ended up too watery I guess I could claim I was making moja? I think I'm a little intimidated since I don't have a grill myself. This books sounds really cute. I was wondering if it was the one Biggie reviewed and said they left out an ingredient in the okyonomiyaki recipe? Other than that I have heard it's pretty good! Mochi! I even have the ingredients and everything, but finding the time is proving difficult. Oh delicious mochi, when can I eat you? I love your blog. It's been really helpful to me as I get into bento! This looks like a very cute cookbook and very useful. What I'd really like to learn to make is okonomiyaki. I've liked it every time I've had it and it seems like something that would work well with a lot of different ingredients. But really, I don't feel like I've been getting Japanese food right. It tortures me because there's no real place in town where I can determine if I've made the food properly. I'll keep trying all the recipes on this website, however. I'm very grateful for it! This seems like a fun book, and being a fan of manga, I would especially enjoy it. I've been looking forward to trying the Steamed buns with roast pork filling (chuuka manjuu), but haven't gotten around to it yet. I would love to try to make kushi dango. I love them so. But I've never tried making them. Thanks for the opportunity to win this book. Well, I don't know if I count because this is my first time really exploring this site. I have not tried any of the Japanese dishes mentioned on this site outside of miso soup which is a favorite. This is only the start in my journey in trying new foods to add variety to my diet. I would love to try miso balls seeing as I love miso soup. I've started creating a cookbook from this website and I plan on moseying down to justhungry to get more! Yakisoba. Or miso soup. It's not that I'm afraid of it per se....but I kinda am. I have never made takoyaki (which I pretty much survived on my first year in Japan, since I didn't get home from work until 11pm). A friend has an æbelskiver pan -- that would work for takoyaki too, wouldn't it? This book looks like it could be really interesting for the class I teach on non-fiction comic books; I'll have to see if Interlibrary Loan can get hold of it. That's really cute! I'd like to read that at some point. I loved eating taiyaki at the Japanese sushi place near where I went to college, especially since they served on fish-shaped plates. It was really adorable. I'd love to make it at home, but I haven't found a good taiyaki pan to use... do you have any suggestions about where I might be able to find one? In the meantime, I have to settle for pancakes with azuki paste spread on top. Cute book! I have never made mochi---I know that it will never be as good as the fresh-made mochi I got at festivals in Japan, so I don't want to put in all that work and be disappointed. But one of these days I'll get up my courage to try! I've always wanted to try making some sort of daifuku. I've eaten them before, but never have tried working with mochi. Western deserts are usually too sweet for my tastes. This cookbook looks like a fun read! Tue, 2009-11-17 21:54 by Dave T.
I'm a big fan of the Instructional Mangas, and since my girlfriend insists on teaching me to cook, I figured it might be appropriate to give this book a read-through. Wow, I came across this site looking for some lunch ideas. I have to admit the apple bunnies are quite cute, and I may have to load up on some Granny Smiths and try it myself! I want to make kushi dango... or takoyaki... no, dango. I want to make the dango! Then eat it. I think I'd end up making the takoyaki too chewy... but I'd probably like the dango no matter how badly I messed it up. The one thing I have never attempted that I really should is making my own sushi. Not with fish, as I am not up to sniff on buying good fresh fish where I live, but just making veggie rolls myself. I haven't tried it yet, and I really want to. As a manga reader/reviewer, I just had to chime in on this one, especially since there are several manga instructional guides out right now. Since I teach college students how to use a statistics software package, I'm actually interested in the statistics one; the other guides look at other science-related subjects, like physics and calculus. Anyway, this looks like a cute cookbook! Thanks for the giveaway, Maki! This looks like a cute book. I am always more motivated to make recipes when I can relate them to something else. It would be very cool to make something that vaguely resembled something I'd read about so many times. It reminds me of when I was in elementary school and briefly had an intense obsession with baking stuff from the cookbook based on stuff in the works of Roald Dawl (it was called Roald Dawl's Revolting Recipes, but they were good, I swear). I want to be able to learn how to make anything dessert ish. I love sweets, but so far I've only tried making savory foods. I'd like to try making Mochi, or something equally yummy and sweet. OMG, I love your site! I make bentos for the little ones all the time. I will have to go through it. I have never made sushi and I would love to make that for my family we all love it. Oh I have been peeking at that cookbook for a while now. I never could justify getting it because it wasn't available when I actually had a Gift Card. I can't wait to check out some of the other suggestions and links from other commentors too :-) thanks for giving us this opportunity! This book looks very cute! I would like to try fresh yuba. I see the dried Chinese kind around here, but would like to try the freshly made type of 'tofu skin', since I love fresh tofu and soymilk. I would also love to eat ikura no shoyu zuke, because it sounds delicious, and anything involving fish eggs is wonderful, in my books. I know this is a second comment, but this post reminded me of a missed opportunity. When I was at the New York Anime Festival recently, I had the opportunity to buy Anime Eats! Cookbook. I wanted to grab it and review it myself, but I am wondering if you've seen or heard anything about it. I really want to try to make inari sushi. They're my best friend's favourite, and I found out I like homemade ones much better (the ones I've eaten in restaurants have generally been a little over-sweet). This book looks like a lot of fun. The one thing I am currently ramping up my (very lacking) skills for is tempura. I absolutely love all things cooked in this fashion and have been starting the research into how I can make it just as good at home as I get in the restaurants. Wed, 2009-11-18 00:02 by Christine M.
Tamago yaki. I've been wanting to make it forever. I haven't made miso soup, but I'd really like to try it. I don't really have a lot of time to cook, though I enjoy it thoroughly. School just gets in the way. I think I know someone who would love this book and $11 is a pretty good price, thank you for giving me an idea for a Christmas present for my much younger, japanophile sister-in-law. This and a cute bento would probably have her jumping for joy, considering she went nuts for some Japanese snacks I put in her birthday present. I hope it has a recipe for agedashi tofu! Ummm, I had to think a bit about this one. I've been in Japan for a while and I've tried many dishes. I still have to cook saba no miso ni. I usually hate cooked fish and this one is the only one I can eat (it comes sometimes with the kyushoku at school). Wed, 2009-11-18 01:35 by Tamar. I would like to try and make vegetarian brown rice sushi at home. Oh I love to cook Japanese food, and I always try to make new Japanese dishes in every chance that I have; when I have the ingredients ;) One Japanese food that really interest me is the cream croquette, Kurimu Korroke. Ah, it sounds yummy. I've planned to make it, but still not yet. It seems kinda hard to make, so I got scared a bit. Actually this is my first time leaving a comment on your blog, after all this time stalking it ;D I love your blog. Good luck with your cookbook! I hope it can be released soon. I think I ll make onigiri. Ooh, I've been thinking about buying this for ages. I thought it might help me transition my boyfriend into eating bento more often. As for what I want to make? I, shamefully, still haven't managed to make a successful octodog. I know, right? I am very new to Japanese cooking, so the possibilities are wide open for me! I did just discover Okonomiyaki and would live to try it.